The movie Friday The 13th: trailer, clips, photos, soundtrack, news and much more! Whitney (Amanda Righetti) and Mike (Nick Mennell) find some sort of shrine in a cabin. Clay (Jared Padalecki) is told to give up hope of finding his sister. Clay (Jared Padalecki) stops Jenna (Danielle Panabaker) from going outside into a trap. This Friday the 13th is directed by Marcus Nispel. There are already talks of a sequel, so Jason Voorhees will come to haunt us in Friday the 13th 2! A group of teenagers at a camp near Crystal Lake will meet Jason Vorhees and his deadly intentions… Jason must have some PhD in slashing! Jason Voorhees (Derek Mears) is coming back to haunt your nights! 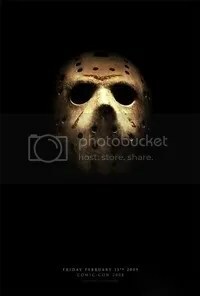 The first poster of Friday 13th is but a mask, buit it is nonetheless quite scary! Guess what: Friday The 13th will be released on February 13th, 2009 which is a Friday 13! The guys is as scary as in the 1980’s! What twisted mind had the idea to put this frightening hockey mask on Jason Voorhrees’ face? Friday The 13th should be released on February 13th, 2009.